Indulging in a glass of wine is a great way to relax after a hard day’s work. Different wines suit different moods, meals, or atmospheres – a light chardonnay will accent a salad or pasta dish, while a deep red will compliment a juicy steak. One’s refrigerator quickly overflows with wine options – and unfortunately, outside of the bottom shelf on the fridge door, refrigerators aren’t too accommodating of multiple bottles. Enter the world of wine storage, where the possibilities are as endless as the different variations of wine. If you’re an avid wine drinker that enjoys a chilled glass of wine with your meal, a wine cooler may be the best solution. A little more aesthetically pleasing than a mini-fridge, wine coolers boast sophistication and come in an array of shapes and sizes, and can hold up to 28 bottles of wine (these are for the true wine-o. The average wine cooler holds about 12 bottles). If you’re of the sort that likes collecting wine from various parts of the country or world, a wine rack is a great way to display your selection. Wine racks can also be used as a decorative piece in the kitchen or dining room. Metal wine racks are available, but the popular choice throughout the years has been wooden. If you’re short on space, consider a mountable rack to house your wine collection. Depending on your preferences, 5 bottles can fit comfortably in a 24” wide space. There are also expansive mountable racks that double as a sophisticated piece of art, and can fill up the nice four foot gap on your dining room wall – while providing storage space for your wine at the same time. If you find yourself with dozens of bottles of wine and a large wad of cash to spend, devoting a space in your basement as a “wine cellar” may be an option to consider. Wine cellars can be crafted professionally, with handmade wooden racks that fill a small room — or you can design the layout yourself by positioning existing wine racks together. A cheap alternative to a wine cellar is a “wine closet”, where wine racks can be positioned in the end of a walk-in closet. Ideally, a wine cellar should be located somewhere that is usually dark and cool, as sunlight can lead to extreme heat, which can prematurely age or brown the wine. Whether you’re a weekender wine drinker or a daily red consumer, clearly, there’s a variety when it comes to storing your wine. In order to choose the best option for you, take into consideration the amount of available storage space you have in your home. 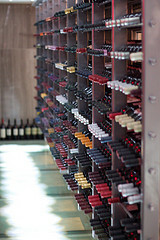 Will a wine rack against the floor in the dining room create a tripping hazard? Is there any floor space in the kitchen or living room for a wine cooler? For those living the high life in a 400 sq foot apartment in Brooklyn, a mountable wine rack is a no-brainer. And, if you’re a serious wine connoisseur with ample money and limitless basement storage, a wine cellar is sure to exceed your wine storage expectations. Are there really wine coolers out there that can hold up to 28 bottles? I am thoroughly impressed. Are they portable? I also really like wine racks. I feel like a lot more of them are becoming more decorative. So even though they are a functional item, they can sometimes work as wall art even when they are empty. I love pieces that can do double duty like that.